Ask fellow campers about "Little Bennett Campground" and nearby attractions. First of all the site we were given D69 was very unlevel. We are full time RVers and have never come across a site anywhere near that bad at a campground. Other than that the campground is very nice, clean, and quiet. They do however seem to have a very strict check out time as someone knocked on our door 6 minutes after 11, then came by again shortly after as we were getting ready to pull out. We have never had someone basically chasing us out of a campground like that before. We camped at Little Bennett Campground in a Fifth Wheel. This is not a regular RV park it is a county park. Located in a forest full of very private places. Verizon WiFi receives good. Good and easy service in the office. Nice and clean place to stay for a longer time. We camped at Little Bennett Campground in a Motorhome. Roads into the park and inside the park are good. Check in was fast and friendly and they offered area information. The park is well maintained. There is a camp store with your basic needs. Lots of trails for hiking and activities for kids. We were in D-51, a gravel pull through with full hook ups. The site is VERY unlevel no matter where you pull in. We used all of our jack pads and our tires were far off the ground. We needed to buy additional sewer hose to reach the sewer connect. To turn the water on - there is a small ring under the faucet that needs to be pulled down - they didn't tell us this but luckily a neighbor knew what to do! The sites are very large and wooded. It was plenty long enough for our 37-foot Class A, tow-dolly and parking the car. Extremely quiet. It seems they are working on the leveling issues, which would give it a 10 star rating. The laundry room and bathrooms are clean. There is no WiFi. Our Verizon signal was good. We stayed May 28 - June 4, 2018 and paid $36 a night with our Passport America discount. We camped at Little Bennett Campground in a Motorhome. 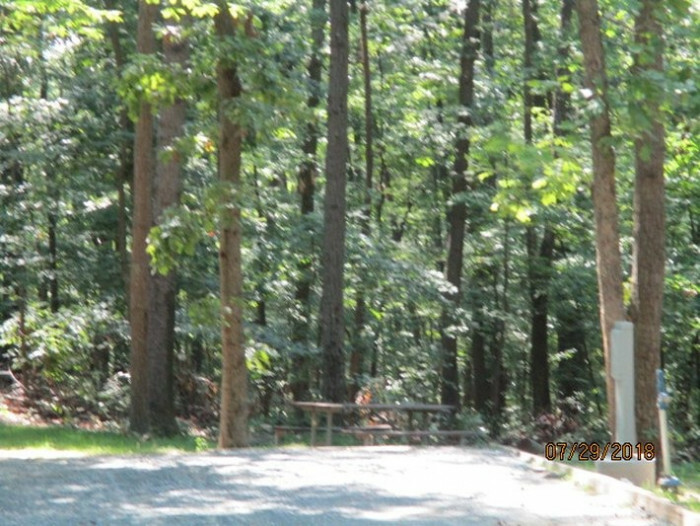 This is a large campground adjacent to a 3700 acre park (we did not venture into the larger park). The attendant was friendly and very helpful. The sites are all wooded. 4 of the 5 sections are for tents (they looked very nice, private and spacious and each section had a RR building). The roads are paved and the sites gravel. The D section has 25 FHU sites for RVs. Most of the RV sites have a gravel area just big enough for the RV and car and a sitting area. 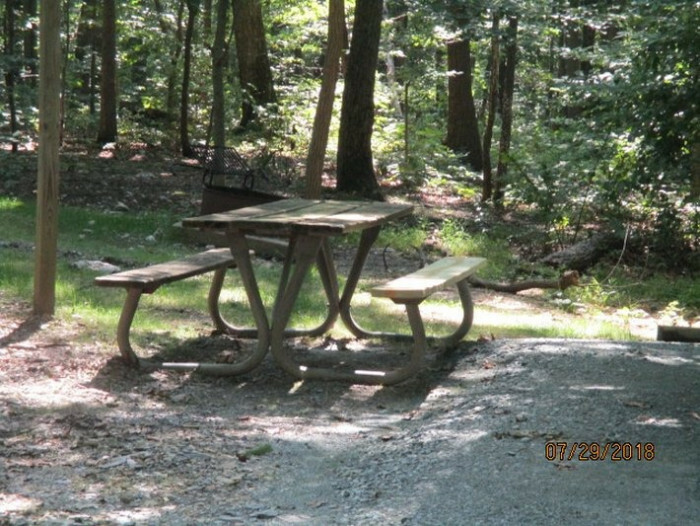 Then adjacent to - or in our case behind us, there is a very large area with a picnic table and fire pit. The sites are very spacious - you can see neighbors, but are not close to them. There is little "landscaping" in the park, but beautiful trees - great "nature." Clean, but bare-bones RRs. Nice activities for kids. The activity center for families is only open on the weekends (something we would not use anyway, but nice for families and groups). Nice trails if you like to hike. If you want to bike ride on asphalt you can ride 3 miles going through the park road and the 5 sections. This is obviously not an RV Resort (and does not claim to be), but is a very, very lovely campground - highly recommended! We camped at Little Bennett Campground in a Motorhome. 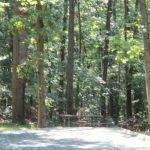 Amenities include a jumping pillow, camp store, pedal carts, pavilion, amphitheater, playground and hiking trails. The RV sites are being upgraded to full hookup status and will be opening in stages during 2018. I had to boondock in the tenting area because of this. We camped at Little Bennett Campground in a Motorhome. The Clarksburg Outlet mall is within a few miles and on the other side of I 270. This is the fourth campground / RV Park we've stayed at in the DC area. $51 for an electric only site is expensive even for this area. The campground's D loop is the only one with electric service, and has water spigots along the road every few sites. This loop has some sites that can handle big rigs, but some sites are only suitable for small RVs. Most sites are unlevel; we needed three wood blocks under each of our rear wheels and more under our jacks, so you probably won't be able to rely just on your jacks. The campground is heavily wooded which is lovely and gives lots of privacy between sites, but also means it's dark inside the RV even during bright sunny days. Interior roads are heavily wooded and some tree scraping was unavoidable. There are a few walking trails through the woods which were great for walking our dog. There are two bath houses, one in E loop and one in C loop. They were reasonably clean but full of webs and bugs in the corners. While the water was hot and pressure was good, the shower stalls were tiny with no shelves to hold your toiletries, and share a changing room separated from the rest of the bathroom by a curtain. There's an electronic gate at the entrance to the park, and when you check in they give you the code to get in any time. AT&T and Verizon both worked fine. Access to I-270 is very quick and easy. We'll likely stay here again because it's the closest park for visiting family. If it wasn't for the very unlevel sites and high price, we'd give Little Bennett a higher rating. We camped at Little Bennett Campground in a Motorhome. Sugarloaf Mountain is very close by, with lots of hiking trails. Be prepared to clean your campsite upon arrival, one of the worst we have experienced and way overpriced for the level of service and amenities provided. Staff was fantastic but appears to be poorly managed. 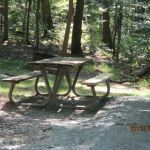 Campground is in desperate need of basic maintenance and upgrades. We camped at Little Bennett Campground in a Travel Trailer. Nice county park, very heavily wooded, 30 or 50 amp power only on D Loop sites. Water available from spigots, not at each site. No sewer on site, but good dump station at exit. Laundry available at interpretive center. Pretty good access to major roads, not far from a metro station. This is an excellent alternative to the outrageously expensive campground at I-95 and I-495. We will definitely stay here again. We camped at Little Bennett Campground in a Fifth Wheel. Washington, DC is just down the road! We really like this park. First stayed because it was close to our daughter and grandkids. Shaded sites. Can't get satellite from roof mounted dome but over air TV is fine. We stay in "D" loop which has electric hookups. Park's website has good info on the sites. Usually will give you requested site. This trip, main trees on main entrance/exit road really needed trimming. Branches getting heavy and could not swerve around all of them. This is our only complaint. Very convenient to shopping/restaurants. 50 amp sites cost a few dollars more than 30. We camped at Little Bennett Campground in a Motorhome. Stayed here for 5 nights while visiting the attractions in the DC area. Very good location for that, convenient to the Shady Grove Metro and the District, Gettysburg, and Antietam, just to name a few. Nice campground with gravel sites which could use a little work on the leveling, so the rating reflects that. Clean bathroom/shower buildings, reasonably well-designed. Very friendly staff. The rate seems a little steep for a County Park campground with no water/sewer hookups, but you're basically paying for the location. Best campground I've found yet in the DC area, but keep your leveling blocks handy. We camped at Little Bennett Campground in a Tent Trailer. Excellent location, close to DC Metro, lots of shopping and restaurants around. Clean park. Alas every site in the electric loop is unlevel. So much so that our auto levelers were not enough. Next time we will try another site even though none of the sites seemed level. 50 amp electric was nice, common water spigots throughout campground, and clean dump station. We camped at Little Bennett Campground in a Motorhome. We really enjoyed this park. It is very wooded and quiet. There is no Wi-Fi or cable TV, and no view of the southern sky for satellite dishes. Water is available for every few sites, so you have to fill your tank and then use your pump. The only dump is at the park entrance. It was very peaceful and serene. We would stay again. We camped at Little Bennett Campground in a Fifth Wheel. One of the most wonderful campgrounds we have ever stayed in. Huge level sites, clean restrooms and showers, incredibly nice staff, gated. It is 15 minutes to the Shady Grove Red Line stop to go into DC. Convenient to major shopping. Outstanding. Would definitely stay here any time. We camped at Little Bennett Campground in a Travel Trailer. Nice Regional park close to a couple of Metro stations for an exciting ride into DC. Very basic. Electric only. Water stations every 100 yards or so in the RV loop. No sewer. Dump station at park entrance. Interesting interpretation of their "Maximum 2 vehicles per site" rule. A MH is a vehicle, so you may only have 1 other. A trailer/ 5'ver is not a vehicle, so you may have 2 vehicles in addition. Is a MH a vehicle by legal definition? Certainly. Is it a vehicle when it is parked and now a camper? In practice, no. But, it's their take on the rule and they stick to it. Strictly enforced too. Usually not a problem, but we were here visiting family, so we had to move our car out to the maintenance parking lot before visitors arrived. Kind of silly, really. Picked up a load of "stink" bugs too. They don't really stink. Trying to get rid of them does. We camped at Little Bennett Campground in a Motorhome. Very pleased with this campground. Not really a destination but a good base camp for area attractions or visiting friends or family in the area or even Washington DC for that matter. The sites were beautifully maintained, compacted gravel, totally level and well draining. No mud and no litter. There are no water hookups but the communal faucets fill up a 5 gallon container in about 10 seconds! It was like a fire hydrant. The campsites are huge and they will let you pick and reserve in advance. Our site was about as big as our lot that our house sits on and was wooded. Lots of shade and very good privacy. The maintenance crews are out and about early and their efforts really show. The security gate is a nice plus. Surprisingly uncrowded for summer. Friendly reception and laundry room was fine. Necessities are not far from this park as it is in a suburban area. They have the mosquitoes under control but just beware of the flying roach things that will come inside at night if you leave the door open even for a brief while. Would definitely stay here again. We camped at Little Bennett Campground in a Motorhome. Are you affiliated with Little Bennett Campground ?